Montrose has been a medical practice for over 130 years. From the mid 19th century this stretch of Glebe Point Road was well supplied by two services – public houses and medical practices. From the mid 19th Century the stretch of Glebe Point Road (GPR) from Broadway to Mitchell Street was well supplied by two services – public houses and medical practices. In Glebe generally there were twenty eight pubs in 1892, one pub per 610 people, but dropping to seventeen by 1914. Glebe historian, Max Solling comments that “The pub in nineteenth century Glebe was larger, and more comfortable than the average working class home, and it was just around the corner”. In the stretch of Glebe Point Road from Broadway to St Johns Road there were five pubs in 1895, the grandest being the University Hotel on the corner of Broadway. Enlarged in 1889 it contained thirty four bedrooms, a billiard room, a public bar, four parlours and five shops. 37 GPR, now Badde Manors Cafe, was the Glebe Hotel, licensed in 1864 at the time of the early settlement of the area. 90 GPR is even earlier, dating from 1858 as theCurrency Lass. 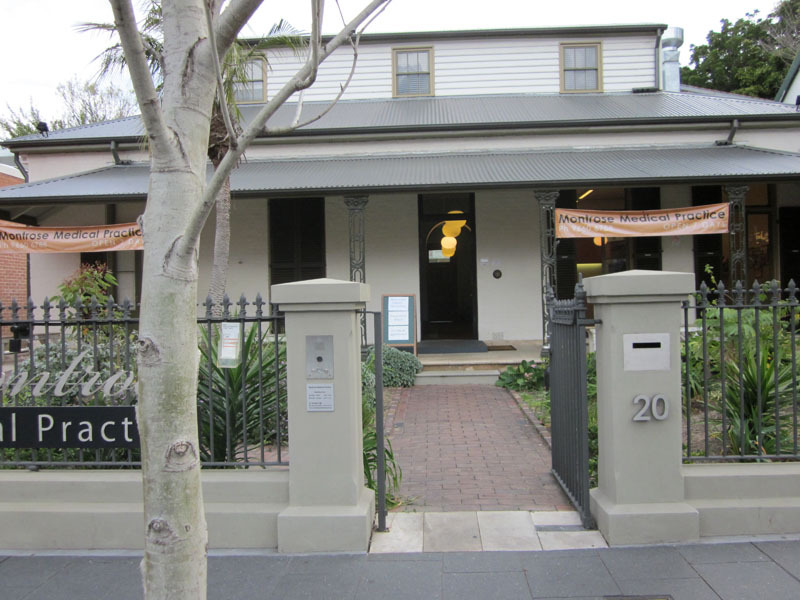 Medical practitioners were a little later in opening in Glebe, although the first was Dr John Foulis who was at 1 Glebe Road by 1860. From the late 1880s the first generation of new graduates from Sydney University’s Medical School commenced practice in Glebe – seven were established by the early 1900s, as well as others trained overseas. Equally important were the dispensaries where chemists and druggists were entitled to dispense medicines prescribed by doctors and also to prescribe treatments. There were at least ten in Glebe in the early 1900s. Restoration of this building won a 2010 Heritage Award. In 2008 Dr Hunter Tuon decided to remove additions tacked on at the front and, in collaboration with his brother architect Austin Tuon, to restore the building. Much of the original fabric is intact, including the joinery and stables. The occupancy of Montrose Medical Practice (Dr Tuon in partnership with Dr Andrew Chen) continues Montrose’s 122-plus-year connection with the medical profession. George Wigram Allen built Montrose and its stables in 1869 as an investment, and the first physician recorded as living at Montrose was Dr Arthur Annesley West who rented the property in 1878. Dr Theodore Kenneth Potts joined the practice of Dr John William Van Rees Hoets at Montrose in 1922, and members of the Potts family – brother Keith, son Theo Junior, and grandson David – continued in practice there until 1996, when it was occupied by the Australasian College of Natural Therapies. Theo Potts Senior was a lodge doctor, that is he treated patients registered with a friendly society (precursor of today’s health insurance), as well as private patients. His patients took their prescriptions across the road to the Sydney United Friendly Society Dispensary at 33 Glebe Point Road.